When a star is young, it is often still surrounded by a primordial rotating disk of gas and dust, from which planets can form. Astronomers like to find such disks because they might be able to catch the star partway through the planet formation process, but it’s highly unusual to find such disks around brown dwarfs or stars with very low masses. New work from a team led by Anne Boucher of Université de Montréal, and including Carnegie’s Jonathan Gagné and Jacqueline Faherty, has discovered four new low-mass objects surrounded by disks. The results will be published by The Astrophysical Journal. “Finding disks in low-mass systems is really interesting to us, because objects that exist at the lower limit of what defines a star and that still have disks that indicate planet formation can tell us a lot about both stellar and planetary evolution,” said first author Boucher, who works at her university’s Institute for Research on Exoplanets (iREx). In a planet-forming disk, the dust grains collide and aggregate to form pebbles, which grow into boulders, and so on, increasing in size through planetesimals, planetary embryos, and finally rocky terrestrial planets (some of which then become the cores for gas giant planets). Astronomers are able to identify these types of planet-birthing disks, because the star heats up the surrounding dust, which affects the way it looks using a telescope with an infrared camera. However, some disks indicate that planet formation isn’t ongoing, but has already finished. These disks are made up of the debris left behind by all the collisions during planet formation and by subsequent collisions of the newly formed planets. Eventually these dusty remains are swept away. But until that happens, a cooler, thinner ring of dust surrounds the star. Some disks even represent an intermediate stage between the planet-forming and dusty remnant phases. It’s important for astronomers to try to distinguish between these different types of disks, because then they can better chart the way planetary systems, including our own Solar System, are born and change over time. The research team was able to determine that the disks surrounding their four newly discovered low-mass objects were all likely in a phase of planet forming. None were in the dusty aftermath phase. Even more interesting, two of the objects are possibly between 42 and 45 million years old. 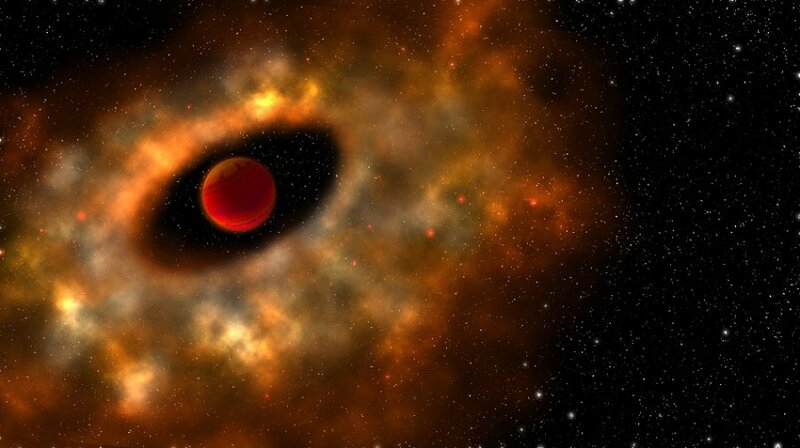 This would make them the oldest objects surrounded by active disk systems ever found. The other co-authors are: David Lafrenière and René Doyon of Université de Montréal, and Lison Malo of the Canada-France-Hawaii Telescope. This work was supported by Fonds de Recherche du Québec — Nature et Technologies, the Natural Science and Engineering Research Council of Canada, and the Centre de Recherche en Astrophysique du Québec. Web Source: Carnegie Institution for Science.